Flare-ups over history, resources and a leader's visit are the focus of Asia News Network commentaries. Here are excerpts. The Mekong rose dramatically on Wednesday when China discharged a huge amount of water into South-east Asia's longest river. The Chinese authorities made sure to give downstream countries advance notice - but it was only one day's notice, too little time to adequately prepare. 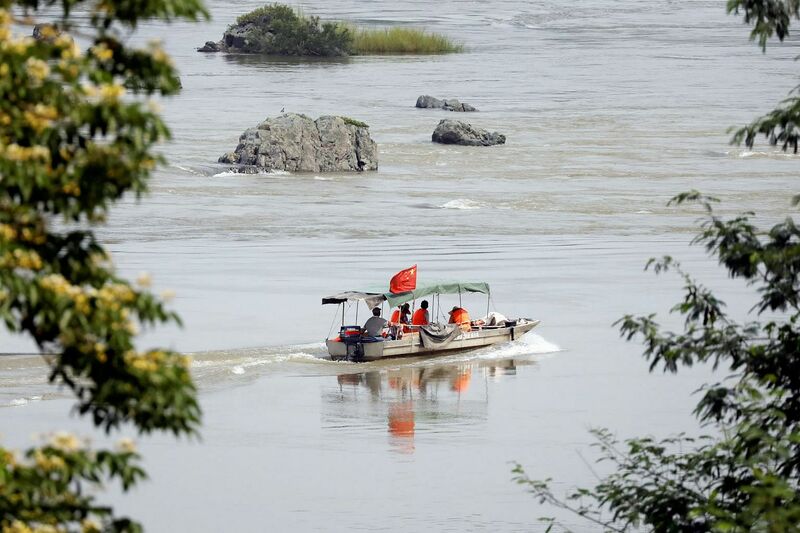 The Mekong River Commission (MRC), an international regulating agency, announced on Monday it had received "emergency notification" from China, a dialogue partner to the MRC, that water would be discharged from the Jinghong Reservoir in a bid to ensure power-grid security. The discharge began at 504 cubic metres per second on Tuesday, gradually increasing to 2,200 cubic metres per second , according to the MRC. The agency established in 1995 is the only inter-governmental organisation representing the four lower Mekong nations - Thailand, Laos, Cambodia and Vietnam. China is not a member, but has since 2002 been obliged to issue advance notifications of such operations by the terms of its "enhanced partnership" with the MRC. China and Myanmar have, however, resisted pressure to become full members of the MRC. Their elevated role would better enable the agency to regulate water use along the Mekong's entire 4,800km length. Chinese territory abuts only 16 per cent of the riverbank, yet China has greatly affected the river's flow by building seven hydroelectric dams on the main stream. It plans to build a dozen more dams, further harnessing a river whose upper reaches meet 45 per cent of China's water needs in the dry season. This has led to understandable fury in downstream nations. Fluctuations due to China's withholding and release of water harm livelihoods and the environment. Extreme changes in the water level affect agriculture, aquaculture, transportation and tourism in the lower basin, and severe impacts from upstream abuses are already being felt in Vietnam's Mekong Delta. That country's south is getting insufficient freshwater to stave off salinity intruding from the sea, ruining cropland and fish farms. Upstream dams block fish migration and the flow of the sediments that serve as natural fertilisers in the delta and shield against erosion. The dry season has begun in Thailand, Laos and Cambodia, when the annual lowering of the river level opens riverbanks to agricultural use. Millions of people grow vegetables in the mineral-rich soil and will lose a crucial source of income if their access is restricted. China is tampering with livelihoods. With its tardy advance notification, Beijing appears to be doing the least it can to be a good neighbour on the Mekong. It would be far better if China became a full participant in MRC deliberations and found a way to cooperate equitably with the other riparian states. By resorting to the old, tricky game of "private and unofficial" transit through United States territory, Taiwan leader Tsai Ing-wen has made her previous "stance" to seek better ties with the Chinese mainland quite doubtful. Foreign Ministry spokesman Geng Shuang had urged the US not to allow Ms Tsai to transit through Hawaii and Guam last Saturday on her way to some Pacific countries, because it would violate the "one China" principle, which not only Washington but also the international community has acceded to. Ms Tsai's transit through the US last Saturday is her second this year. In January, she stopped over in Houston and San Francisco on her way to and from Latin America. Although the US insists that there is no change in its "one China" policy, Ms Tsai would do good to avoid such severe provocations if she really wants to improve cross-strait ties, which have deteriorated since she assumed the role of Taiwan leader in May last year. On Oct 26, before Ms Tsai embarked on the provocative trip, Mr Ma Xiaoguang, spokesman for the mainland's Taiwan Affairs Office of the State Council, reiterated that the 1992 Consensus holds the key to the peaceful development of relations between the two sides of the strait. His remarks came in response to a speech given that day by Ms Tsai, who reiterated her "stance" to improve cross-strait ties while trying to beautify the role her ruling Democratic Progressive Party (DPP) has played in past cross-strait exchanges. She delivered the speech at a forum celebrating the 30th anniversary of the resumption of exchanges between the mainland and Taiwan. Such actions and remarks have brought her approval rating down. In fact, polls do not bode well for Ms Tsai, as a recent survey shows more than 50 per cent of Taiwan residents are not satisfied with her performance and policymaking, particularly her failure to fully recognise the 1992 Consensus. With so much at stake, she had kept a close eye on the 19th National Congress of the Communist Party of China and the report delivered by general secretary Xi Jinping at the opening session on Oct 18, which stressed that the "one China" principle is the political foundation of cross-strait ties. The central leadership's resolve to fight separatist forces on the island is in contrast to Ms Tsai's ambiguous stance on cross-strait ties, which led to the suspension of official communication channels between the political parties on the two sides last year. Equivocation on the "one China" principle will also put extra pressure on Ms Tsai's cross-strait approach as the mainland steps up its efforts to fight the secessionist forces. The resumption of contacts between the political parties on both sides, as Ms Tsai said in her latest address, is indeed key to better cross-strait ties. But that would be possible only when Ms Tsai and the DPP stop the play of words and offer a clear answer to whether or not they accept the "one China" principle. South Korea's latest court ruling is wrongful, as it is based on loosely determined facts. The decision cannot possibly be accepted. In overturning a lower court acquittal of Park Yu Ha, the Seoul High Court has sentenced the Sejong University professor charged with defamation regarding her book, Teikoku no Ianfu (Comfort Women Of The Empire), to pay a fine for her offence. The latest ruling said that some descriptions in the book are false, such as "state violence in the form of forcible recruitment was not perpetrated in Korea" and "Korean comfort women had a comradely relationship with the Japanese military". Saying the book has greatly lowered society's estimation of former comfort women, the court concluded that these descriptions constitute a case of defamation. In South Korea, a citizens group supporting former comfort women has strong influence. It is inevitable for the court to be viewed as having catered to public opinion aroused chiefly by the civic group to cause anti-Japanese sentiment. Park's book raised objections to the one-sided view held in South Korea regarding the comfort women. On the other hand, it accused the "Empire of Japan" of responsibility for having created harsh circumstances surrounding the comfort women. The book is a well-balanced work involving much elaboration. The issue of comfort women was diplomatically resolved through an agreement reached between the two nations towards the end of 2015. However, the administration of South Korean President Moon Jae In has not clearly said it will implement the deal. In South Korea, there are persistent calls to renegotiate the issue. There are concerns that the latest ruling could encourage such a move. Teikoku no Ianfu has also been published in a Japanese-language version. The guilty ruling will cast a shadow on the views held by Japan about South Korea. Can South Korea be described as a nation that shares fundamental values with our country? Doubts about this are likely to grow stronger.